One Momma Saving Money: X-Men: Apocalypse - on Blu-ray now! X-Men: Apocalypse - on Blu-ray now! In spite of the X-Men changing history in the last film, there has been no ripple effect going forward. In this installment, Professor Charles Xavier school for mutant kids has reopened and their are new students that you will remember from the original X-Men movies. As a fan of the X-men series, I enjoyed learning the back stories on all these characters. 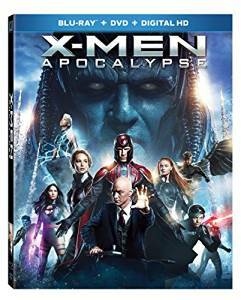 Apocalypse, the most powerful mutant in Marvel's X-Men universe gets his hands on Cerebro to recruits a band of mutants to go along with his plan to destroy mankind, Raven and Beast band together to save other mutants, Professor X and possibly the world in this action packed hit! Purchase X-men: Apocalypse Blu-ray on Amazon for 19.99 & FREE Shipping on orders over $49.